A magnificent year-round holiday retreat on picturesque Skeleton Lake. As the name Hermitage suggests, this unique property on 3.5 acres and 540 feet of lake frontage offers complete privacy and the perfect getaway. The Hermitage was featured on "Luxury Lakefront" on Cottage Life Television in 2018. It features a quality, custom-built cottage and boathouse, both with numerous luxury features. The 5000 square foot cottage, featuring 4 bedrooms and 3 bathrooms, is nestled among mature trees and beautiful granite rocks. The property has been landscaped to blend into the beautiful, natural surroundings and the buildings have been designed to complement this setting. The cottage interior is stunning and has many unique features that blend gracious, luxury living with a casual vacation home lifestyle. The exotic hardwood floors in cabbage bark and poisonwood, and the mixed exotic hardwood ceilings throughout make this a one-of-a-kind property. Most of the wood in the cottage is hardwood from Central America, including the kitchen cabinets, stairs, railings, doors, and much of the furniture. This unique blend of unusual woods gives the cottage a warm, rustic, yet elegant charm. Large wood-framed windows provide stunning views from every room, allowing you to enjoy the natural beauty even indoors. The cottage is designed around a magnificent, cathedral-ceiling great room with a huge, floor-to-ceiling river rock fireplace, a wall of windows offering a breathtaking long view of the lake, and cabbage bark floors. At one end of the the main level is a family room with a large river rock fireplace and a wall of windows overlooking the lake. At the other end of the main level is an office/library with two walls of windows presenting stunning views of the lake in two directions. Sliding patio doors lead to the deck. The open concept kitchen has a large island in mixed exotic hardwoods that is great for snacks or just for chatting with the chef. The dining area has a view of the lake and sliding patio doors open directly onto the deck. There is a convenient main floor laundry room. French doors lead from the kitchen into a large Muskoka room/sunroom, with a high, vaulted ceiling in exotic woods and walls of glass windows and doors, that provides magnificent views of the lake and woods. Three sets of sliding doors lead from the Muskoka room directly onto the deck. Enjoy breakfast or a romantic dinner on the deck or in the Muskoka room, enjoying gorgeous views in all directions. A magnificent, wide wooden staircase of mixed exotic hardwoods leads to the upper floor. A loft area with a large balsam infra-red sauna and workout area overlooks the great room and has a gorgeous view out over the lake. The loft separates the master bedroom and ensuite from the other three bedrooms. The master bedroom, with a king-size poster bed, has beautiful poisonwood floors and glorious views of the lake in two directions from immense windows. The walk-in closet is completely cedar lined. The ensuite bathroom has a heated, natural slate floor, a long poisonwood and slate vanity with two sinks, a large shower of glass and slate, and a long 6.5 feet BainUltra ThermoMasseur air tub with programmable cycle, chromotherapy, and heated back. At the other end of the loft, a hallway leads to 3 bedrooms, all of which have a lake view. The bathroom at this side of the upstairs has a large shower with slate walls and glass door. End your day relaxing in the sauna or the ThermoMasseur air tub. A huge walk-out basement is completely finished, featuring slate floors and huge windows that also have a gorgeous view of the lake. There is an attached double garage and a large parking area behind the cottage, with additional parking on the access road. The cottage has a commanding, long view of beautiful Skeleton Lake. Natural granite stone steps grace the main entrance and another set of stone steps lead to a boardwalk that runs along the sunroom around to a large deck. The 700 square foot, private deck of exotic hardwood with glass railings offers gorgeous views of Skeleton Lake and some of its most picturesque islands. A cedar stairway descends down to the boathouse. The cottage is winterized for those who enjoy winter sports and activities. Four-wheel drive recommended for winter access. This unique property is situated at the end of a private road and ensures complete seclusion. It is truly a one-of-a-kind property that will allow you to experience Muskoka at its best in all four seasons. This quiet waterfront property on Skeleton Lake should provide you with one of your most memorable vacations ever. Above the two-slip boathouse is 650 square feet of beautiful living space. The living quarters include an open concept living and kitchen/dining area that has breathtaking views of the lake from three sides. You can sit around the wood-burning stove on chillier evenings and enjoy the views of the lake. 3 sets of sliding patio doors lead from this area out onto the large sun deck that wraps around the boathouse. Floors, ceilings, and walls are entirely in pine, providing a bright, warm, rustic atmosphere. At the back are two bedrooms with queen-size beds and sliding patio doors that open onto the deck. The bright pine bathroom has a large shower. Above the bedrooms is a large loft with sleeping area that overlooks the living room and the lake. Older children will love the loft! Have breakfast or a BBQ dinner on the deck. Enjoy the call of the loons. Relax in the hammock. Fish off the deck. Jump off the deck into the lake. The lapping waves will lull you to sleep. You’ll never be closer to the water! The boathouse is available for rent separately in May, June, September & October. When the boathouse is rented separately, the cottage will not be rented. The boathouse is closed in the winter. Sandra is a retired professor of Modern Languages and the author of numerous books on French and comparative literature. People say it has the most stunning views in all of Muskoka. The views of Skeleton Lake and the surrounding forest are breath-taking and you have complete seclusion. The wildlife is abundant. You can engage in a wide variety of activities right from the doorstep. The unique custom-built cottage features a variety of exotic hardwoods from Central America. Infra-red Sauna; BainUltra ThermoMasseur Air Tub with chromotherapy; 2 floor-to-ceiling River Rock Fireplaces; Games Room with Pool Table, Air Hockey, Poker Table, etc. ; Kayaks; Paddle Boat; etc. The cottage has stunning views of Skeleton Lake. The property has 540 ft of lakefront on pristine Skeleton Lake. Cottage, 2 Fireplaces, Satellite TVs, PVR, Jenn-Air Range, Pillows & Comforters/Blankets are provided, BainUltra Air Tub, Infra-red Sauna, Hammock, Boathouse, Boat Dock, Wood-burning stove, Bar refrigerator, Toaster Oven, Hot Plate, Paddle Boat, Pillows & Blankets are provided, Linens and towels are included. 5 Star plus. If you want a great place to stay in Muskoka this is it. Thank you for your review. We are delighted you enjoyed your stay at The Hermitge. It was a pleasure to have you and your family come to The Hermitage. Thanks again. Could not have wished for more! My family and I had the privilege of staying at The Hermitage for a week in July. The property is beyond stunning, and was the absolute perfect destination for our party of 9 (5 adults, 4 children). The view from the main cottage is like something from a postcard, and is both tastefully decorated and extremely comfortable. There are lots of spaces to gather together, or to find a place to be alone! Our children particularly enjoyed the games room in the basement, which has a pool table, foosball, air hockey, and poker table. We spent many hours at the boat house, which has a kitchen, bathroom, and bedrooms. The owners generously encouraged us to use their kayaks, paddle boat, canoe, and tin boat. We had a dream vacation and were extremely impressed with the owners' attention to detail, and thoughtfulness during our stay. We could not recommend staying here more! We are delighted you enjoyed your stay at The Hermitage and thank you for the very nice review. The Hermitage is a special place and we would be delighted for you and your family to come back again sometime. It was a pleasure having you stay at The Hermitge. Thank you again. (and sometimes all day) but one while we were there, we LOVED our stay. The main cottage is both spacious and warmly welcoming, and the boathouse is charming. Despite the rain, we kayaked and swam a bit, hiked, and watched thunderstorms and sunrises over the lake (the latter encouraged by the huge windows in the bedrooms). I can't imagine anyone would be disappointed with any aspect of their stay. And the owners were a pleasure to deal with. 5 stars are not enough for this gem. Hello Rosemary, We are delighted you enjoyed your vacation with family at The Hermitage despite the rain. We throughly enjoyed helping to plan your family vacation. We are extremely happy The Hermitage exceeded your expectations. For privacy and view, it doesn't get much better in Muskoka. Thanks again and we look forward to you and your family coming back to The Hermitage very soon. Our team spent the Thanksgiving Weekend at the Hermitage. The pictures did not prepare us for the beauty of our surroundings, the comfort and luxury of the cottage and the stunning views from each window of the house. We spent our days hiking, kayaking, playing pools, air hockey etc in the games rooms, watching movies and sports in the larger than life TV room and hanging out at the boathouse house which in itself is a beauty. It was a perfect getaway for our group and a great place to team build. I would recommend staying at the Hermitage any time of the year in its peaceful natural surrounding. Thank you Paul and Sandra from the INDS Team. We are delighted your team enjoyed The Hermitage and we are also delighted you hope to come back again to The Hermitage. It was the perfect time for the changing of the colours in Muskoka. Thanks again. Me and My family rent this cottage every year, it is a luxurious cottage with lots of space. It has a great view of the lake, it comes with some kayaks and fishing rods. The lake is a very quiet lake with lots to do and explore, there is plenty of forest to hike through, it is very secluded which works out perfectly for my hijabi mother. Honestly the pictures don't do this place justice, its more beautiful in person and the price is more than fair considering how many this cottage sleeps. Thank you for your kind words. We are delighted that you have come to The Hermitage for 4 years in a row. 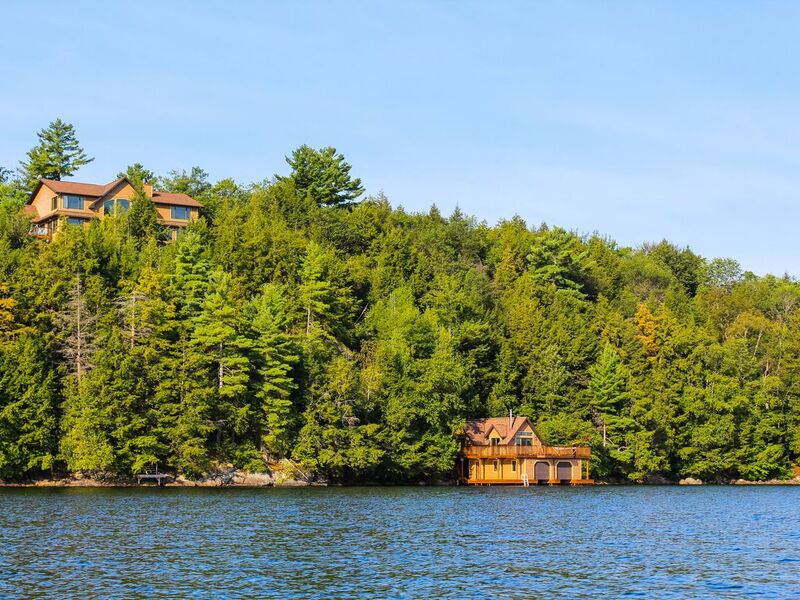 For privacy and view, it doesn't get much better than The Hermitage in Muskoka. Thanks again and we look forward to your visit next year. Even after seeing photos we were not prepared for how truly beautiful this cottage would be. "Luxury" is being modest; this cottage literally has EVERYTHING you need for a perfect getaway. We were a team of 13 and it slept us comfortably with more than enough room to spare. I was able to watch the most beautiful sunset from the comfort of my bed from the Lake View bedroom from in the main cabin and it was absolutely breathtaking & a memory I will hold onto. The games room was a huge hit with our team: pool table, air hockey, foosball you name it! We definitely appreciated being able to roll in with a huge group and not worry about activities, the hermitage had us covered! The Boat House was equally impressive with a gorgeous deck that was great for lazing out on and even better for making a big splash into the beautiful waters that surround it. We had a blast Sandra, thanks for everything! The beautiful Muskoka region, which is located about 2 hrs. north of Toronto, is bounded by Georgian Bay on one side and Algonquin Park on the other. Muskoka is among the world’s celebrated lakelands. The area was discovered by Samuel de Champlain in 1615. The region features many scenic lakes surrounded by wooded hills and granite rock and offers a wide range of activities year round to suit all tastes and age groups. The unique character and natural beauty of Muskoka draw people from around the world. Skeleton Lake was formed by the impact of a meteor, explaining its somewhat circular shape and great depth. That is also the reason for the limestone bottom, which gives the lake its famous clarity. In the heart of Muskoka, the Hermitage offers a wide diversity of activities in all seasons. Relax and enjoy the natural beauty or engage in a wide choice of sports, sightseeing, cultural events, and other activities. Summer Sports include Hiking, Biking, Golf, Boating, Swimming, Waterskiing, Wake-boarding, Tubing, Jet Skiing, Fishing, and Fitness Centre. Boat Rental is available in the area. There are two Marinas on Skeleton Lake. Winter Sports include Sports: Cross-country Skiing, Snowmobiling, Snowshoeing, Sledding, Skating. The Hermitage is located very close to both cross-country and snowmobile trails. The many sightseeing options include: Steamship Cruises on Lake Muskoka, Museums, Santa’s Village, Algonquin Park. All the roads between Highway 11 and Highway 69 in the Muskoka area are extremely scenic, in particular Highways 518, 141, 3, 118 and 169. The towns of Port Carling and Rosseau are well worth a visit. Other Activities: Wildlife Viewing includes deer, bears, wolves, coyotes, wild turkeys, and many other animals and birds. Stargazing from the cottage deck or the boathouse deck is breathtaking. Shopping includes many unique stores and boutiques. Excellent restaurants range from fine dining to casual. Cinemas and theatre.